It’s been called one of the most famous and widely distributed images in human history. The “blue marble,” a 1972 color photograph of the Earth from the Apollo 17 spacecraft, has also been credited with expanding environmental awareness around the globe and highlighting the vulnerability of our home planet. In the four decades since the blue marble was captured on film, other astronauts and unmanned spacecraft have trained their lenses on the Earth, sometimes while in orbit, other times while racing toward another celestial body. I stumbled upon some of these images while surfing the Web recently and have collected my favorites in a PowerPoint deck that you download at the bottom of this post. I find these images captivating, even mesmerizing. They’re also useful in creating presentations. 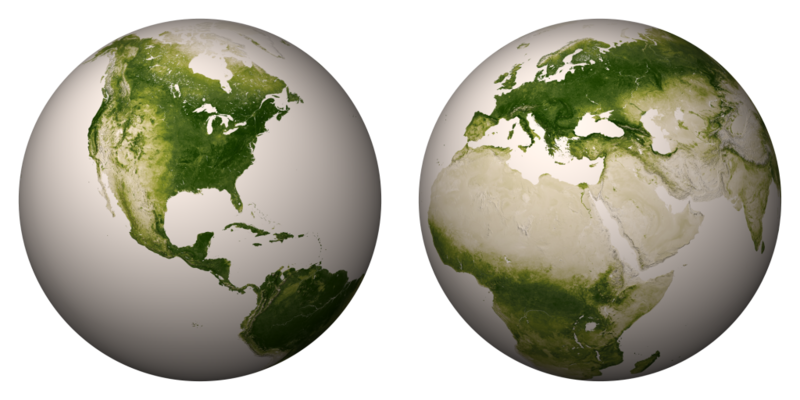 NASA’s next generation of blue marble images can be downloaded as very high-resolution files that allow you to zoom in on an area of interest (see our earlier post to learn about similar, high-res images of the Earth’s vegetation). 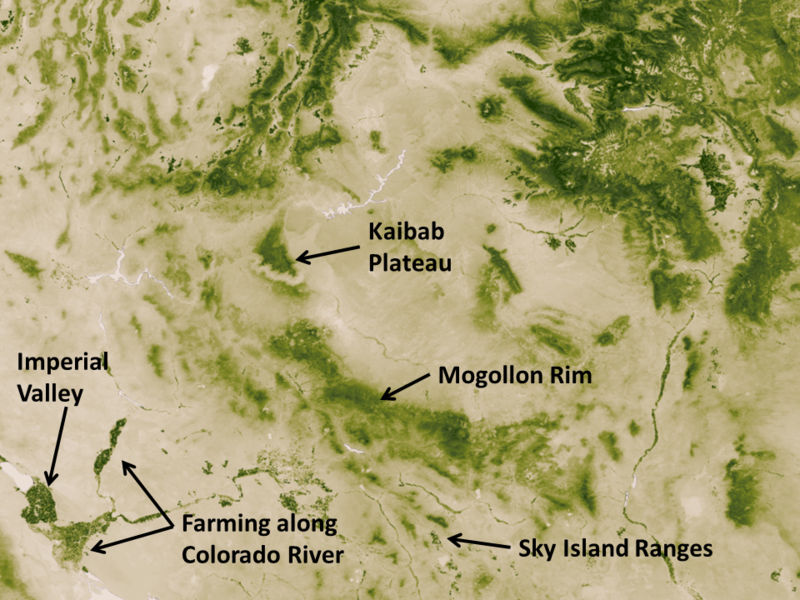 We often take the 30,000-foot view here at EcoWest, trying to understand mega-trends in the American West, but occasionally it’s worth stepping back even farther, to many millions of miles away, so we can see the truly big picture. Below I describe 10 of the views, including some animations, that I found most striking (click on images to enlarge). 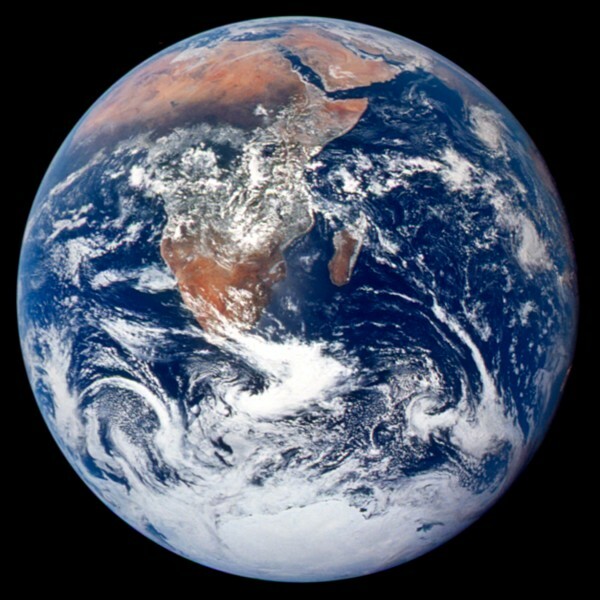 The iconic blue marble photo was taken on December 7, 1972 as the Apollo 17 spacecraft departed Earth for the moon. The image was snapped 5 hours after liftoff and 2 hours after the spacecraft left its parking orbit around Earth. The spacecraft was already 28,000 miles away from the planet and situated perfectly for the shot–with the sun behind the camera, the full disc of Earth was visible. 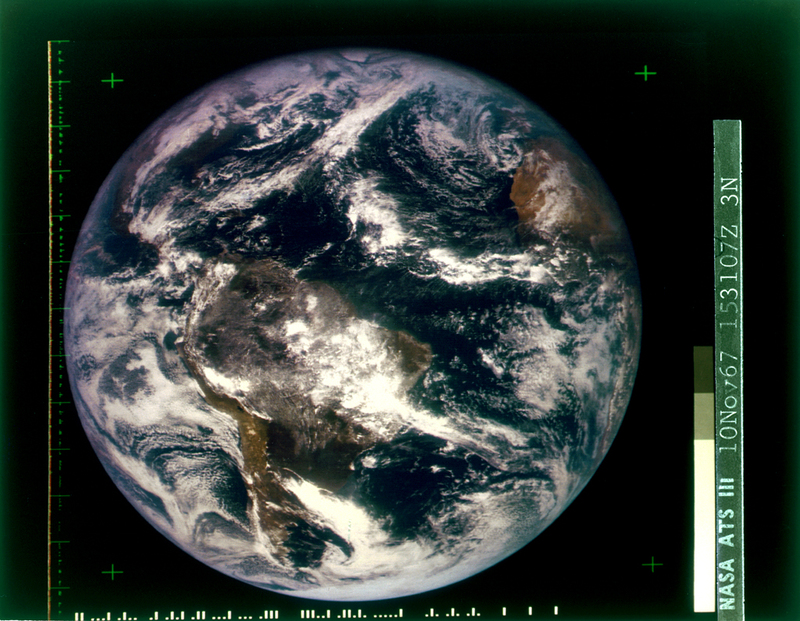 The blue marble wasn’t the first time the full Earth had been photographed in color. 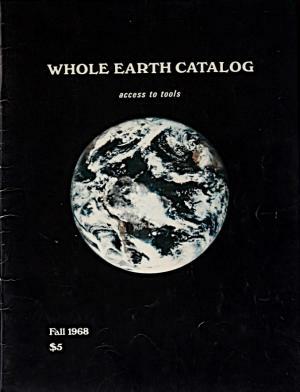 The image below, captured by the ATS-3 communications satellite in 1967, was on the cover of the Whole Earth Catalog in fall 1968. 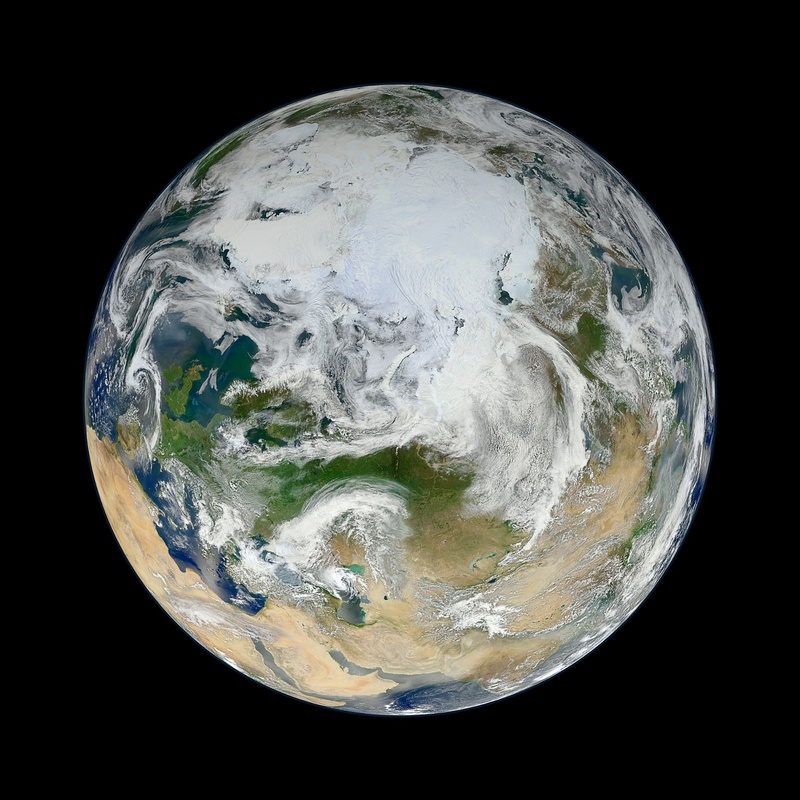 NASA’s next generation of blue marble imagery takes advantage of a variety of satellites and stitches together many months of observations to provide a clear view of Earth. Much of the data came from the MODIS device on the Terra and Aqua satellites. Below is the view of the Western hemisphere. 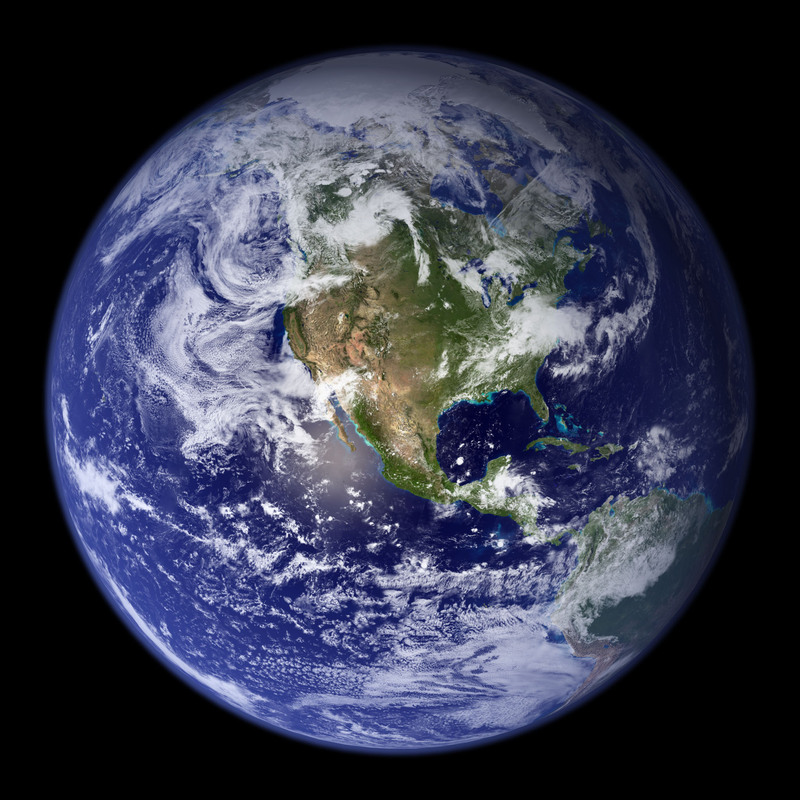 The abundance of water on our planet visible in the “Blue Marble” photo clearly separates us from all others in the solar system. The flows and interactions of clouds as part of our weather also appear prominently in the photo. The interconnectedness of all the spheres—hydrosphere, atmosphere, cryosphere, and lithosphere—into one sphere is the power of this image and of later images of the Earthtaken from unmanned spacecraft. It’s been an epoch since I took Earth science, so I confess to looking up cryosphere (ice caps, glaciers, etc.) and lithosphere (crust and mantle). At first glance, you may not recognize the planet depicted below. That’s because you’re looking down on Earth from over Siberia, rather than from the typical equatorial vantage point. In this view of the Arctic, based on 15 passes by the Suomi-NPP satellite on May 26, 2012, you can get a sense of why melting the Greenland Ice Sheet would lead to a cataclysmic rise of sea levels by some 24 feet. The dark side of the Earth has plenty of lights, as shown in the image below from April and May 2012. 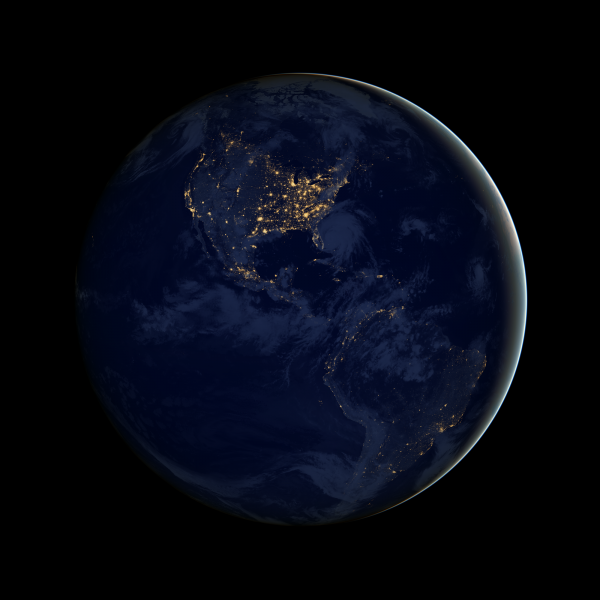 NASA’s city lights series provides a powerful summary of development patterns across the globe. The PowerPoint deck includes some close-ups of the United States, but even in this hemispheric view you can see how the country’s population is concentrated in the eastern half and along the West Coast. As the Galileo spacecraft departed Earth in 1990 for its exploration of Jupiter, it looked back and captured this sequence of images over a 25-hour period. The Deep Impact spacecraft, launched in 2005 to study comets, sent back stunning images of the moon transiting the Earth. This animation shows a lunar transit in 2008 from 31 million miles away. 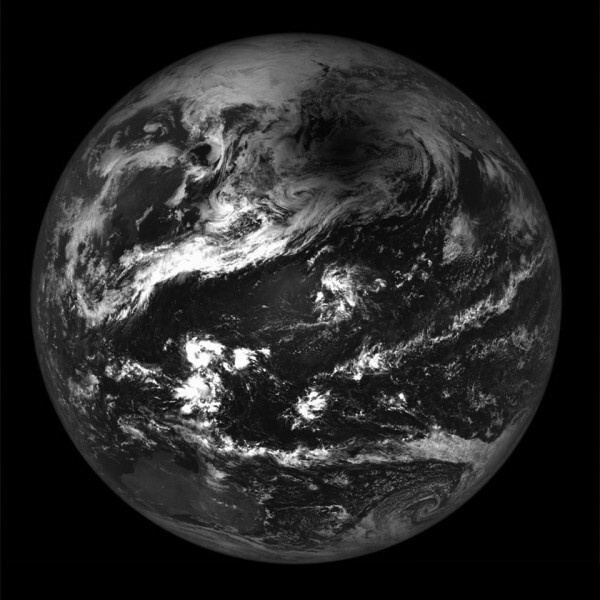 The Lunar Reconnaissance Orbiter, launched in 2009, captured the May 12, 2012 solar eclipse in the image below, which shows the shadow over the Aleutian Islands. OK, so this one’s a little different, but I would urge you to check out the video embedded below, which shows what the Earth looks like to the crew of the International Space Station. There are some spectacular views of the night lights, aurora borealis/australis, and lightning flickering in thunderstorms. The video is a time-lapse compilation of photographs taken by the crew of the space station, which orbits about 260 miles above Earth at 17,200 mph. Earth from Michael König on Vimeo. Finally, to put things in perspective, there’s this recent view of the Earth from the Cassini spacecraft orbiting Saturn. 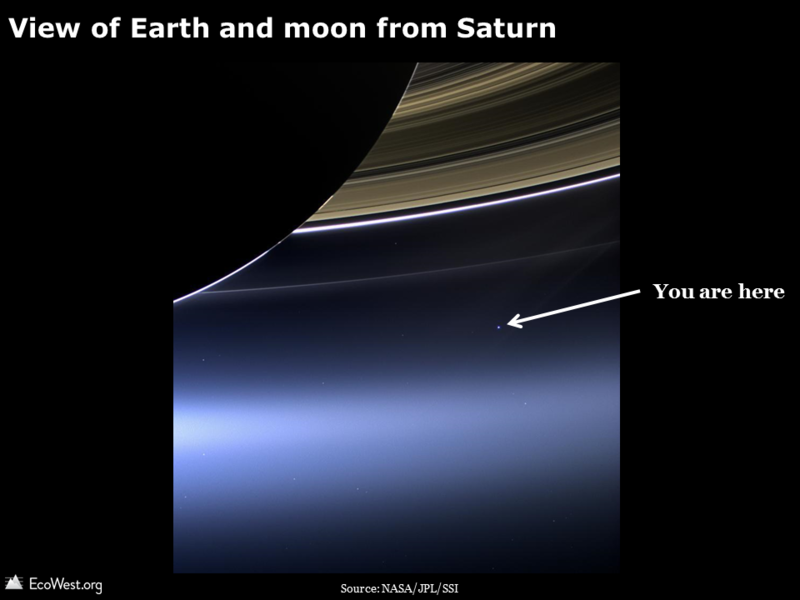 From 898 million miles away, our planet is just a dot. In the years ahead, I’m sure we’ll be treated to even more stunning images of planet Earth. The Deep Space Climate Observatory, originally proposed by former Vice Preident Al Gore and possibly inspired by the original blue marble photo, is scheduled to be launched in 2015 by the SpaceX company. The observatory, which became a political football, will be situated about 1 million miles from the planet, at a point where the gravitational pull of the Earth and Sun cancel. From there it will warn of potentially harmful solar activity, and have a continuous view of the sunlit side of Earth. The best source I found for whole Earth images is this page on the Planetary Society’s website. NASA’s blue marble images are found on this page and described further here. 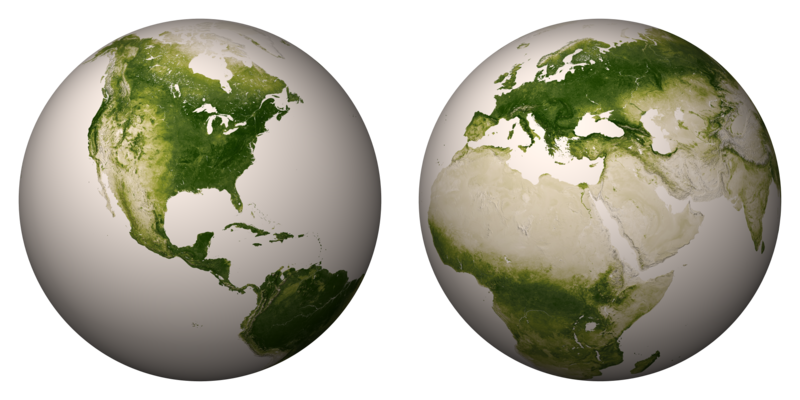 Scientists have released new high-resolution maps that illustrate the lushness of vegetation, or lack thereof, around the globe. Researchers at NASA and the National Oceanic and Atmospheric Administration (NOAA) used satellite data from April 2012 to April 2013 to create maps like the ones below (click to enlarge). “The darkest green areas are the lushest in vegetation, while the pale colors are sparse in vegetation cover either due to snow, drought, rock, or urban areas,” NASA/NOAA says. Below I’ve zoomed into the Southwest, where you can clearly see the irrigation along the Colorado River. I’ve also marked some notable islands of green, such as the Kaibab Plateau and the elevated archipelago of “sky island” mountain ranges in Southeast Arizona. 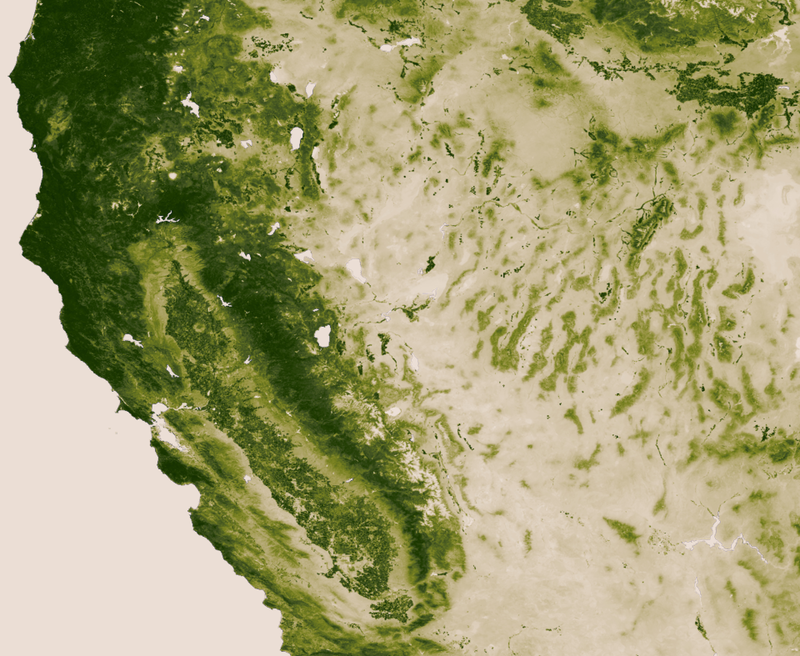 NASA/NOAA create a new greenness image every week. With a resolution of 500 meters (each pixel depicts about 62 acres), the weekly maps weigh in at 13 gigabytes each. You can download a 30,000 pixel by 15,000 pixel image (176 megabytes) and that’s what I’ve used to create the close-ups above. 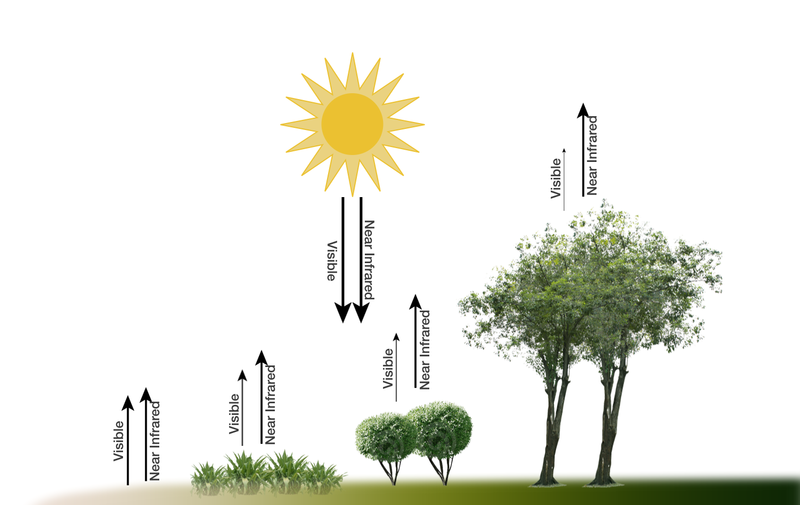 Below is a video tour that shows how the vegetation changed during one year, both due to the changing seasons and human activities. The footprint of cities in Europe and Asia is striking. 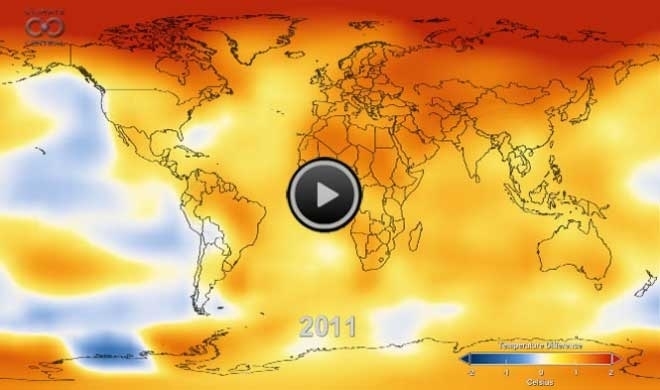 NASA has produced a fascinating animation showing how global temperatures have been changing since the late 19th century. You can really see things heat up starting in the 1970s.